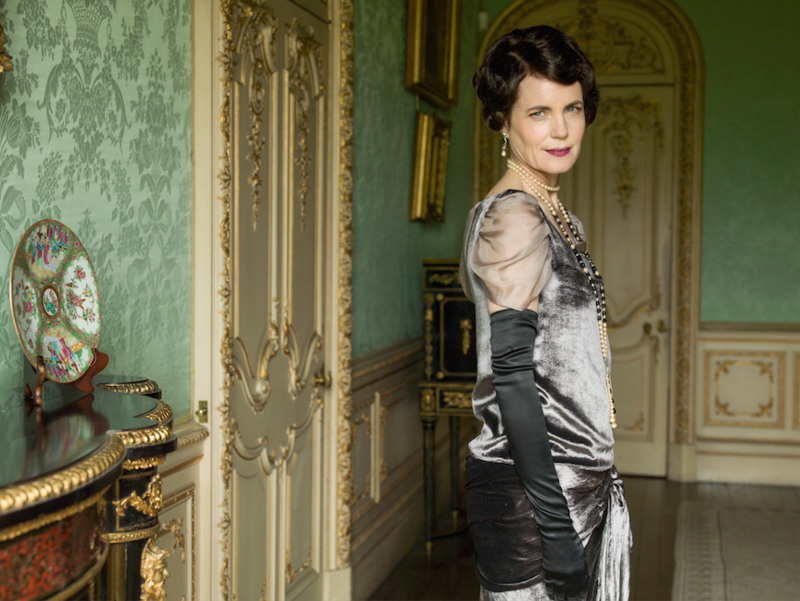 Elizabeth McGovern as Cora, Countess of Grantham. ARLINGTON, VA; December 21, 2015 -- PBS today announced that “Downton Abbey” on MASTERPIECE cast member Elizabeth McGovern, who portrays Cora, Countess of Grantham, is among those confirmed to ride a float celebrating the show in the 127th Rose Parade® on January 1, 2016. The float, themed “The Final Adventure” (a nod to the parade’s theme of “Find Your Adventure”), celebrates the much-anticipated “Downton Abbey, The Final Season,” a Carnival Films/MASTERPIECE co-production airing Sundays, beginning January 3, 2016, at 9:00 p.m. ET on PBS. In “Downton Abbey,” McGovern plays American heiress Cora, Countess of Grantham, a role that has garnered nominations for a Golden Globe® in 2012 and a Primetime Emmy® in 2011. Other credits include her Oscar® and Golden Globe® nominated performance in Ragtime (1981), Ordinary People (1980) and The Wings of the Dove (1997). For the float, the Crawley family estate has been painstakingly recreated in float form, complete with a magnificent landscape depicting English rose gardens and rolling green lawns and a 1919 Bentley driven by the family chauffeur. The float will feature more than 60,000 roses in 20 different varieties including velvety “Roseberry” and “Cherry O” roses; fragile pink “Titanic” and “Priceless” roses and English garden roses, which are rarely seen at the Rose Parade. Oriental lilies, snapdragons, hypericum and a variety of orchids will provide accents throughout the garden. Since its debut on PBS in 2011, “Downton Abbey” has been a runaway hit with fans. Season 5 of the series, which concluded on March 1, 2015, was seen by 25.5 million people. The season had a weekly average audience of 12.9 million viewers over its nine-week run (Source: Nielsen Live+7 data). With 59 Emmy® nominations, more than any other non-US show in Emmy® history, “Downton Abbey” is one of the most-honored series on television. It has won 12 Emmys®, three Golden Globes®, three Screen Actors Guild Awards, a Producers Guild Award and three BAFTAs, as well as a 2015 BAFTA Special Award in recognition of the series’ outstanding global success. For news and updates pertaining to “Downton Abbey,” go to pbs.org/downton or follow #DowntonPBS on Twitter. “Downton Abbey” is a Carnival Films/MASTERPIECE co-production written and created by Julian Fellowes. It is executive produced by Gareth Neame, Julian Fellowes, Liz Trubridge and Nigel Marchant. Chris Croucher is the producer. The executive producer for MASTERPIECE is Rebecca Eaton. The senior series producer for MASTERPIECE is Susanne Simpson. The top-rated primetime show on PBS, MASTERPIECE is presented on PBS by WGBH Boston. Rebecca Eaton is executive producer. Funding for the series is provided by Viking River Cruises and Audible, with additional support from public television viewers and contributors to The MASTERPIECE Trust, created to help ensure the series’ future. WGBH Boston is America’s preeminent public broadcaster and the largest producer of PBS content for TV and the Web, including FRONTLINE, NOVA, AMERICAN EXPERIENCE, MASTERPIECE, ANTIQUES ROADSHOW, ARTHUR, CURIOUS GEORGE and more than a dozen other primetime, lifestyle, and children’s series. WGBH also is a major supplier of programming for public radio, and oversees Public Radio International (PRI). As a leader in educational multimedia for the classroom, WGBH supplies content to PBS LearningMedia, a national broadband service for teachers and students. WGBH also is a pioneer in technologies and services that make media accessible to those with hearing or visual impairments. WGBH has been recognized with hundreds of honors. More info at www.wgbh.org. Carnival Films is a division of NBC Universal International Studios and is the UK’s largest drama specialist. The company is responsible for the global TV sensation Downton Abbey, winner of three Golden Globes and 12 Primetime Emmy awards, including Best Mini-series. It is the most-nominated non-US show in the history of the Emmys with a total of 59 nominations and is now in over 250 territories worldwide. Among numerous national and international awards, including three Screen Actors Guild Awards and three National Television Awards, the show has even garnered a Guinness World Record for highest critical ratings for a TV show, and the BAFTA Special Award in recognition of its outstanding global success. Downton Abbey is executive produced by Carnival’s managing director Gareth Neame, who sold the production company to NBCUniversal in 2008. Founded in 1978, Carnival Films has produced many hundreds of hours of popular drama both in the UK and US, including primetime series such as Poirot, Hotel Babylon, Whitechapel, Dracula and The Philanthropist, as well as miniseries such as C4’s iconic Traffik, David Nicholl’s The 7:39, David Hare’s Worricker Trilogy as well as William Boyd’s BAFTA-winning Any Human Heart, and Peter Morgan’s BAFTA-winning The Lost Honour of Christopher Jefferies. The sixth and final season of Downton Abbey is currently aired on ITV in the UK and returns to PBS in January 2016. Carnival’s latest series The Last Kingdom recently concluded on BBC TWO and BBC America. Stan Lee’s Lucky Man also airs on Sky One in 2016. Carnival Films was recognized as best production company at the 2011 Bulldog Awards and 2012 Broadcast Awards.